A runtime exception denoting that a node or property at a supplied path was not found. 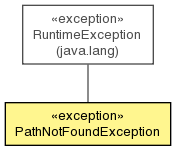 This exception does contain the lowest ancestor of the path that was found to exist. Get the lowest (closest) existing ancestor of the non-existant location.